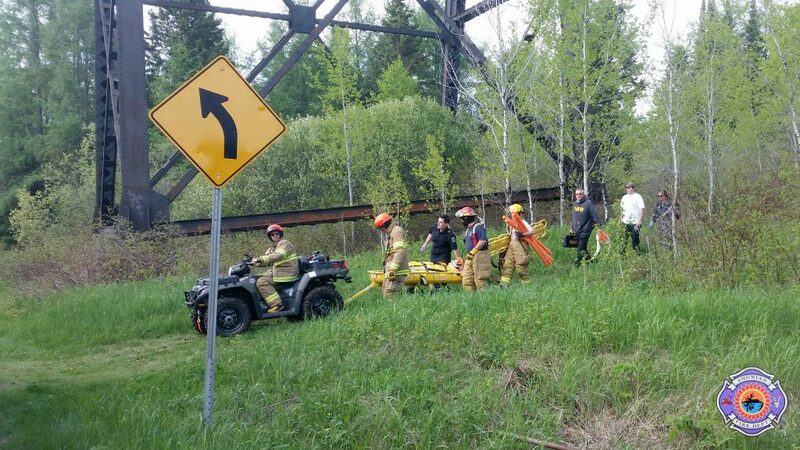 Shuniah (June 9, 2016) – At approximately 5:30pm on June 8, 2016, Shuniah Fire & Emergency Services and Pass Lake Fire Department received a request for assistance for a male who had been impaled by an object near the CN Rail Trestle Bridge on Highway 587. It was learned that a nineteen-year-old Thunder Bay man was taking photos from the top of the trestle bridge with a group. When they were returning to the highway, he slipped off a rock backwards and impaled his leg on a piece of wood and hit his head. Shuniah paramedics stabilized the patient while fire crews cut the wood with a saw and extricated the man in the rescue stretcher attached to the rescue quad runner. Four Pass Lake and seven Shuniah firefighters had the patient safely to the waiting ambulance within an hour of receiving the call for assistance. The man was transported to hospital in pain but in otherwise stable condition.